With the Mobile Theme Switcher you provide a friendly website for your customers. It does not matter if they shop with you from their PC or iPhone, from a Smartphone with Windows Mobile or Android, or perhaps they prefer their MAC. It is no longer important if they like IE or FF or any other browser. This extension allows you to control HOW you customers will see your store. You can set it so that your design themes depend on a browser customers use, an OS, a language – or combine all together. Create as many rules on theme display as you need and make your customers enjoy a friendly and convenient interface of your store! 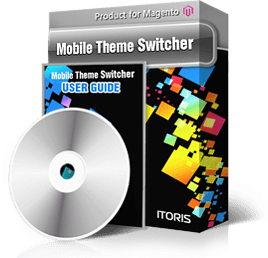 Use the following link to check how the Mobile Theme Switcher works - DEMO. When you open the link in a Desktop browser you will see the default Magento theme. If you open it on your iPhone or in any other mobile browser you will see iphone Magento theme which is designed specially for mobile's screen resolution.